Looking to repeat Day one’s success, we begin to look at Day two of the ESL Pro League Season 8 Finals. In today’s matchup, we will be looking at a much closer game than yesterday’s. MIBR, currently ranked fifth in the world will be taking on NRG, currently ranked sixth in the world. They will now compete for a spot in the upper bracket of round 3, which will be crucial for a proper playoff seed. MIBR, since the team’s establishment just a few short months ago MIBR have not had the results desired by its core members. Several new additions have helped the team become more competitive against new rising talent. Tarik as a player and YNK as a coach have dramatically shifted the team’s win condition, improving their win rate against top-tier teams. NRG, a diamond in the rough of the North American scene, NRG have climbed their way into being the second best team in all of North America. Though, when faced with formidable foreign talents NRG have struggled to translate the success they found on home soil. This series will be a Best-of-Three and MIBR will be the team to come out on top as NRG struggles to find themselves at home on foreign soil. 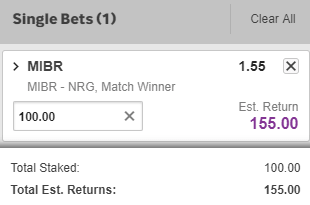 Betting tip / prediction: MIBR to win the game.